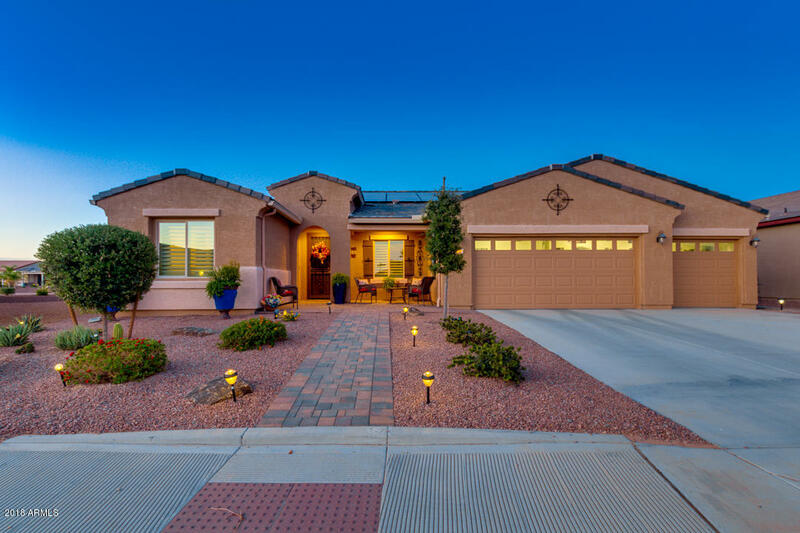 A fantastic 3 bed, 2 bath, plus Den property located in the wonderful adult Province community in Maricopa is now on the market! Owner has over a $100k in updating with the yard and finishes. This beautiful premium waterfront lot home boasts desert landscaping, 3 car garage with built-in cabinets, formal dining and living areas, plantation shutters, elegant light fixtures, and designer paint throughout. The fabulous kitchen offers ample cabinet and counter space, a pantry, stainless steel appliances including a wall oven, and a charming island with breakfast bar. The grandiose master bedroom includes bay windows, a private bath with double sinks, and a spacious walk-in closet. Outside in the lovely backyard you will find a covered patio, seating area with built-in BBQ, and a fire pit .